Currently browsing posts filed under "Dan Drezner ’90"
With the pardon of the sheriff, with the order to the military Re: transgenderpeople in the service, I’d have slapped up a shot of Der Fuhrer faster than lightning. 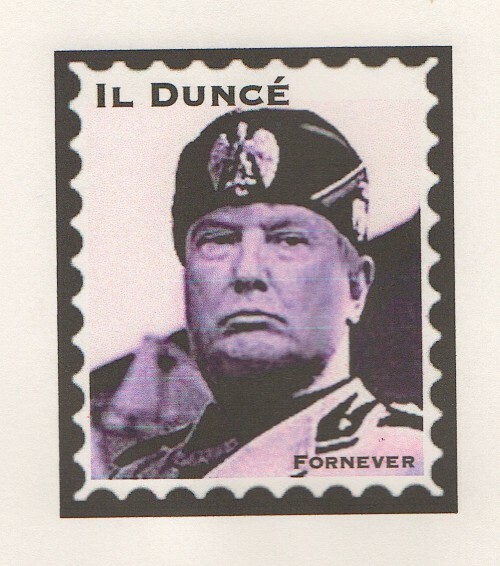 But JCD is right, I’ve been over-using Hitler as an easy allusion for Drumph and Fascism. So here is a new simulacrum that I’ll use. It’s a little lighter with a touch of humor. Although the situations grow less and less humorous. ** Granted, this is a meta reference to Williams. However, one that may be familiar to constant readers. At David’s good suggestion to search harder for a Williams College reference, I am adding this more direct beat-back. Keystone pipeline exempt from “Buy American”. Didn’t THE SPEECH have an applause line set-up for the assurance of “Buy American”? So sit right back and let me tell you a story about one of the hidden costs of Donald Trump’s economic motto: Buy American and Hire American. Read the whole thing. My main takeaway is that there is a lot of fat to be cut from the US budget! Constant Readers of Ephblog know that my posts are rarely done for intellectual discussion and/or an in-depth look at a stance or belief. They are done simply as head turners, as head-turners about the particular issue. This is the case on “Steel Yourself”. I am pointing out the chicanery of the speech itself with its set-up applause lines. I must add that while I have no problem with Dave’s reference to Drezner’s article, I have trouble from an editing point-of-view with adding an extension to a post obviously done for brevity. His addition is what “comments” are for. 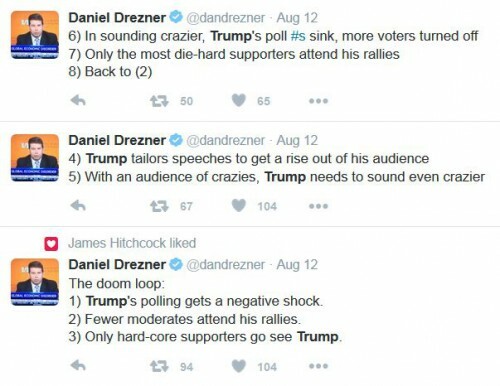 Dan Drezner (and many EphBlog regulars) assured me last month that “Trump will be crushed.” Perhaps that word does not mean what he thinks it means. 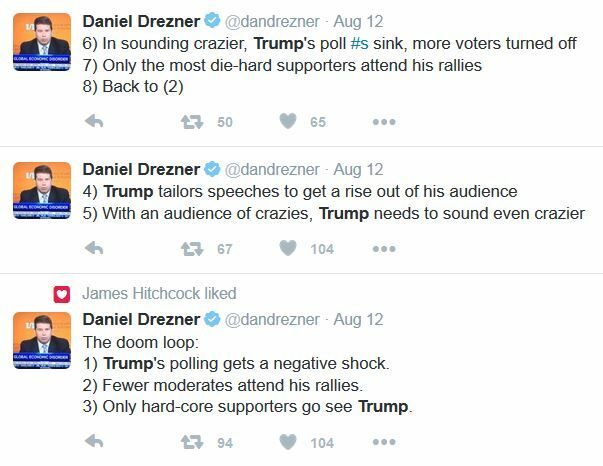 But, of course, Drezner ’90 is a highly credentialed political scientist, a tenured professor at Tufts. He must know much more about how to win a US presidential election than an idiot like Trump . . . The Financial Times has nice things to say about The System Worked, the latest book by Dan Drezner ’90. While reading Dan Drezner’s The System Worked, I kept thinking of the well-publicised conversation between Barack Obama and Tim Geithner that took place shortly before Obama’s inauguration as president in January 2009. Geithner: Your accomplishment is going to be preventing a second Great Depression. Obama: That’s not enough for me. I’m not going to be defined by what I’ve prevented. Geithner: If you don’t prevent a depression, you won’t be able to do anything else. Obama: I know. But it’s not enough. For global economic governance, as opposed to Presidential legacies, avoiding economic catastrophe when catastrophe was a non-trivial possibility is enough. That’s the case made by Drezner . . .
Dan Drezner ’90 reviews books about the financial crisis in The National Interest. EARLIER THIS year, Goldman Sachs CEO Lloyd Blankfein attempted to justify his professional existence, proclaiming, “We’re very important. We help companies to grow by helping them to raise capital. Companies that grow create wealth. This, in turn, allows people to have jobs that create more growth and more wealth. . . . We have a social purpose.” This all sounds good enough, except that finance went from being responsible for 2.5 percent of GDP in 1947 to 7.7 percent in 2005. And at the peak of the housing bubble, the financial sector comprised 40 percent of all the earnings in the Standard & Poor’s 500. The incomes of the country’s top-twenty-five hedge-fund managers exceeded the total income of all the CEOs in that index. And by 2007, just about half of all Harvard graduates headed into finance jobs. If capital markets merely serve as conduits from savers to entrepreneurs, then why does such a large slice of them get siphoned off to compensate people like Lloyd Blankfein? To put it more broadly, what is the role of finance in a good and just society? [T]he candidates are God awful. Seriously, they stink. Just to review our choices: Democrat Martha Coakley has a prosecutor’s complex that would make Javert seeem like a bleeding-heart liberal. She is a God-awful politician so out of touch with reality that she accused Red Sox hero extraordinaire Curt Schilling of being a Yankee fan (Schilling’s blog response is here). Based on the ads I’ve seen, her campaign has also been, by far, the nastier of the two. This leaves Republican Scott Brown, who based on his vacuous Boston Globe op-ed, is an empty shirt with no actual policy content whatsoever. He was in favor of health care reform before he was against it. He can’t stand the run-up in government debt, and wants to cut taxes across the board to take care of the problem — cause that makes perfect economic sense. The one thing he is unequivocally for is waterboarding suspected terrorists. Seriously, these are my mainstream choices? These people are the recipients of all the political firepower both parties can muster? I’m inundated with 24/7 political blather so I can choose between Nurse Ratched and Bob Roberts? Indeed. Although comparing Coakley to Ratched is . . .
What does Mark Taylor love more than anything? Other people talking about his ideas! So, in the spirit of springtime, I will post daily link to commentary on Taylor’s New York Times op-ed, first discussed by JG here. Hey, this is a fun idea — let’s try to come up with other one-word concentrations! Let’s be clear — this idea is crap. Utter, complete, ridiculous crap. There are plenty of interdisciplinary majors, and more are being created as new problems arise. Taylor’s topics are so silly that I began to wonder if he was purposefully self-sabotaging here. To sum up: this is a mostly silly, badly written op-ed that seems designed to provoke peals of laughter in order to scuttle the few good ideas contained in it. Errr. I mean . . . uhhh . . . Read the whole thing. Who are your intellectual heroes? Adam Smith, Albert Hirschman, Thomas Schelling, Friedrich von Hayek, and Samuel Huntington. Who are your cultural heroes? Joss Whedon, Whit Stillman, Frank Miller and Alan Moore. I share Dan’s intellectual heroes (although Hirschman is overrated), but have never heard of any of his cultural heroes. Not that that’s a bad thing . . .
EphBlog is powered by WordPress and delivered to you in 1.231 seconds using 42 queries..